In this episode of Confetti Park, children’s author Tommie Townsley of Lake Charles, Louisiana narrates the story of Amos the Artistic Alligator. Set in the Atchafalaya swamp, this is the tale of how Amos the alligator tries to outsmart old Mr. Homer, a Cajun trapper, who is looking for the perfect alligator to be placed in the zoo. But Amos and his friends create something that most alligators would never think of, and the surprise adds a cute twist to the story. 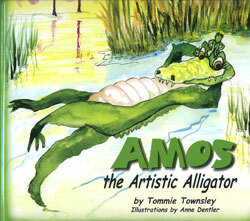 Tommie Townsley was born in Sulphur, Louisiana and now lives in Lake Charles. She is Cajun and has written numerous children’s books about Cajun life, many of them about animals.